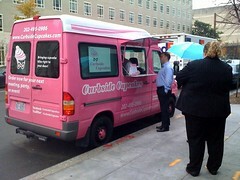 After some disputed results in a high-tech election, it was announced late yesterday that Curbside Cupcakes brought home the first Curby award for excellence in food truckery. Congratulations to all who participated in the great event, and to its sponsors at DCRA and elsewhere for putting on this awesome event. DCRA also posted a great photo with Cupcake Chef Samuel and the award certificate. Congrats Samuel & Kristi!